Have you heard this one before? While many first time drinkers say that Kombucha has a distinct vinegar-like flavor, the taste buds of long-time drinkers are often recalibrated to barely register the tartness of properly fermented Kombucha. However, if allowed to ferment aerobically for a long time (at least 30-60 days or more in a small batch), the resulting liquid will grow more and more sharply sour until it can rightly be classified as Kombucha Vinegar, almost definitely too sour a flavor for sipping by even the most iron-stomached of Kombucha connoisseurs. If you brew Kombucha for any length of time, at some point you will forget about a batch or just end up leaving a few Kombucha mothers in fermented tea for longer than normal. Don’t worry, it’s not ruined…In fact, it now has even more uses around the house and can help you brew up quick batch of booch too! Vinegar has been in use as a flavoring agent, preservative and health tonic for over 10,000 years and can be fermented from nearly any sugar containing fruit. The word vinegar comes from the French “vin aigre,” literally sour wine, and was likely discovered by accident when wine was allowed to go bad in the vat. 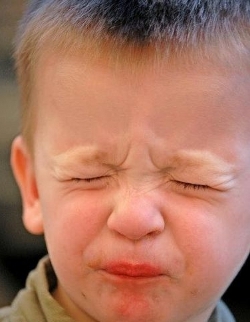 Sour refers not only to the taste but to the fact that it is fermented. Not unlike Kombucha, the naturally occuring sugars of the grapes, malt, rice or other base ingredient for the vinegar is fermented into alcohol by yeast. Then bacteria consume the alcohol and convert it to healthy acids including acetic acid. Kombucha, like vinegar, is an acetic acid ferment. Vinegar is well known to have many uses: from treating wounds, to cleaning, to salad dressing, it’s versatile and useful. 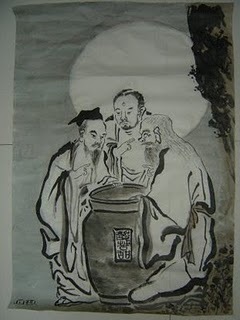 “THE THREE VINEGAR TASTERS” – Three men dip their finger in a vat of vinegar and taste it; one man reacts with a sour expression (Confucius), one with a bitter expression (Buddha), and one with a sweet expression (Laozi). Their expression is interpreted to represent the predominant attitude of their respective ethos: Confucianism saw life as sour, in need of rules to correct the degeneration of people; Buddhism saw life as bitter, dominated by pain and suffering; and Taoism saw life as fundamentally good in its natural state. Another interpretation is that since they are sharing the same pot, they are one. The typical drinkable Kombucha ferment contains about 1% acetic acid. Compare that to the average vinegar (apple cider or white), which is quite potent in its original state and is diluted to around 5% acetic acid, and it’s clear that Kombucha is much less acidic and less concentrated. Acetic acid, created by our bacteria the acetobacter, is responsible for Kombucha’s “bite” as well as some benefits. Kombucha vinegar will range higher in acetic acid concentration than regular Kombucha depending on many factors including the time of ferment, amount of sugar, amount of culture used, etc. A typical Kombucha vinegar is estimated to contain around 2% acetic acid concentration. In addition to being easier to drink and containing a wide variety of healthful acids and vitamins, what sets Kombucha apart from vinegar is gluconic acid. Gluconic acid is a highly effective chelator which pulls heavy metals and other toxins from the body. It also imparts a sweet/sour flavor and inhibits bitterness. If you don’t already have some very old Kombucha fermenting away, Kombucha vinegar is easy to make. Simply allow a batch of Kombucha to ferment until all of the sugar is consumed. You will know that all the sugar has been converted when the Kombucha tastes really sour. Once it has turned to vinegar, then use it according to the recipes below. A beauty secret of many celebrities is to remove built-up residue from artificial products using a natural vinegar hair rinse . The acetic acid cuts through the gunk, stripping the dull hair and returning a natural sheen. Kombucha is gentler on the hair than vinegar but just as effective. Some use Kombucha as a hair tonic after every shampoo. I use the Kombucha vinegar straight on my hair. I still use shampoo but gave up conditioner ages ago(though after reading up on my brand at EWG, I’m considering no-poo (see below)) After rinsing out the shampoo, I apply the Kombucha hair tonic straight to my scalp starting with the top of my head and work my way down until it wets every surface. I squeeze out the excess and then leave it in to dry. The aroma quickly dissipates when your hair dries. Alex finds it a bit too intense for his scalp so he dilutes his hair tonic with half filtered water. I like to add herbs for a nice aroma and hair beautifing benefits. A growing number of people are moving away from chemical laden shampoos altogether by trying out the “No-Poo” lifestyle. Alex stopped using dandruff shampoo several months ago and instead uses Kombucha hair tonic with organic herbs we add from our garden. After a brief adjustment period, his scalp and hair are healthier without the constant chemical bombardment and he is completely dandruff free after 22 years of using stinky blue shampoo. The Kombucha hair rinse leaves his hair soft, shiny and controls oil. There are a couple of different ways to utilize the herbs. I usually add them straight to very old Kombucha, then let them sit for 1-2 weeks breaking down the plant and soaking up the herbal goodness. From there, strain out the flower pieces so they don’t get stuck in hair. Once strained, I choose to store the hair tonic in a glass bottle in the shower. Another way to infuse the herbs is to steep them in hot water for 20 mins or in cold filtered water for 24 hours. Strain and add the liquid to your Kombucha vinegar – this has the added benefit of diluting the old KT. A 50/50 Kombucha to water mix is a good starting point for experimentation. Want even more herbal body care recipes? Check out Earthly Bodies Heavenly Hair. Vinegar used on the skin has a tonifying effect, inspiring cellular regeneration by stimulating the small capillaries under the skin. The weak acid gently dissolves the bonds that hold dead skin cells together and creates a mild, completely natural acid peel which exfoliates. Because Kombucha Vinegar is at a lower concentration than regular vinegar, this toner can be used daily. Its mild antiseptic properties rebalance the skin’s natural pH, preventing an imbalance of bacteria that can lead to acne. Add 1 Tbl Lavender flowers & 1 Tbl Rose petals to 2 cups of Kombucha vinegar. Allow to steep for 2 weeks. Strain flowers. Apply toner to cotton ball and gently swab face. May be used daily. Regular drinkers of Kombucha report that drinking 4-8oz of KT daily helps curb sugar cravings, which in turn helps clear up acne from the inside! Most commercially produced cleaners carry a skull and crossbones – if they are so toxic, then do you really want them on your countertops? Vinegar has a long history as a cleaning fluid. Here are just a few of the ways in which you can use Kombucha vinegar in your household cleansing routine. For loads more cleaning tips, check out this site. Use full strength in a spray bottle on all surfaces. Wipe clean with a soft cloth – no rinsing needed. Add a drop or two of tea tree oil or lavender oil for anti microbial properties and a pleasant scent. Spray down showers and tubs to reduce soap scum. Add ½ cup of Kombucha vinegar to the wash to brighten colors and soften clothes. Remove mineral deposits from your coffee maker or dishwasher – run 1 cup of Kombucha vinegar through a cycle. Add ½ Kombucha and ½ water to a bowl. Boil in microwave. Wipe microwave clean. 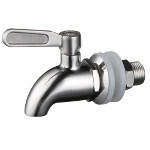 To keep the drain running – Pour baking soda down a drain, follow with Kombucha vinegar. When foaming stops, rinse with hot water. Repeat until clog is loosened. 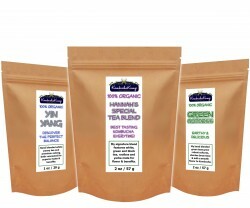 Kombucha vinegar can be infused with any number of herbs, garlic or savory spices to create unique, flavorful dressings. 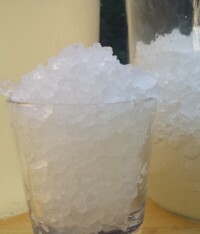 Greens are often bitter – adding salt makes the greens taste more palatable. Several vitamins found in vegetables are fat soluble so the olive oil aids in delivering them to the body. Plus you get a small dose of beneficial bacteria to help digest your food more efficiently. Add your favorite herbs to old Kombucha. Allow to infuse for 2 weeks. Strain and combine with your favorite oil, salt and spices. After the herbs have infused then combine ¼ cup of Kombucha vinegar with ¾ cup of extra virgin olive oil, 1 tsp ground mustard, 1 tsp garlic powder (or 1 clove of fresh garlic finely chopped), salt & pepper to taste. If the mixture is too tart, add a pinch of sugar. Whisk all ingredients together until combined. Pour over salad. This Kombucha Vinaigrette Recipe from my friend Jenny at Nourished Kitchen is another great option. Marinades not only add flavor to meat or tofu dishes but also break down the meats tough fibers. Weak acids like lemon juice, vinegar or wine work best at accomplishing both of these tasks. For less expensive cuts of meat that are known to be tougher, marinating is essential. Beef and tougher cuts can be marinated for several hours or overnight. For tender meats like pork, only a few hours is needed. I use Kombucha vinegar when I brine a chicken for roasting. I like to get whole organic, free range chicken at the local co-op. 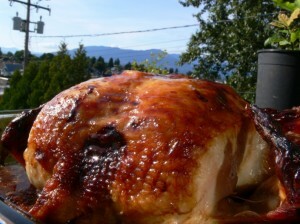 My favorite way to get a moist, juicy bird every time is to brine it first. Friend Hella D does a Kombucha marinated Chicken too – looks yummy! Chop fresh herbs – rosemary, thyme, oregano and combine with ½ cup of softened butter. Apply liberally to exterior of chicken after brining for delicious flavor and crispy skin. Add the whole chicken to a deep pot or bowl. Cover the chicken with filtered or fresh water. Add all ingredients. Make sure the chicken remains submerged in the liquid. Store in the fridge overnight. Preheat the oven to 350F. Drain liquid from the chicken. Rinse chicken and pat dry. Gently loosen the skin of the chicken using your fingers. Insert pieces of garlic and herbed butter/ghee/coconut oil under the skin. Place in roasting pan and bake for 30 minutes. Every 10 minutes, baste the chicken with herb butter. Broil on high for 2-3 minutes to crisp up the skin. Remove from oven when thermometer reads 165F and juices run clear. What is your favorite use for Kombucha vinegar? This piece was delightful on every level. Glad I never threw away the six bottles of over-fermented kombucha that are so explosive I can open them only outdoors! Wow! great ideas and so glad that you all found so many ways to turn vinegar into awesomeness! 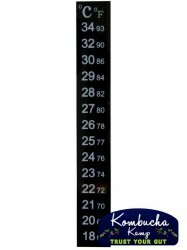 I way over brewed a batch and so appreciate the k vinegar tips! I threw out most of my scoby since it was really thick and felt like plastic it was so firm! I was able to peel off enough to start my next batch. For the future are there any thoughts about using the scoby like this? Or get rid of it? Also my big question, I have my scoby hotel in the fridge. Is it supposed to be out? What I do is mix some KV with freshly made KT so that I get the degree of soreness that I prefer and drink it down. I’m also assured that I get the right amount of gluconic acid in the process as well as other enzymes. Its the nature of the brew – since the organisms in each vessel vary slightly, so too will the brews even if done side by side on the same day with the same ingredients. Welcome to the magic of fermentation! I like to use is to soak my fruit and veg to remove waxes and chemicles I dilute it in purified water and leave fruit and veg for 20 minutes. I’ve brewed some kombucha vinegar on accident, 18 gallons of it actually. Can I just use it in place of starter? Yes! Kombucha Vinegar can definitely be used as starter liquid. Just tried something that had been brewing in the back of my brain for awhile. Having recently fallen in love with Korean hydro-gel beauty masks, I wondered if I could make my own from an “old” scoby that had formed in my hotel. Since the hotel is a 2 gallon jar, the scobies are fairly large, and this one, being fairly new, was relatively thin. I took the plastic backing from one of my Korean masks and used that as a template for cutting eye openings and a nose vent. Although the scoby wasn’t large enough to cover my whole face, it covered the forehead, around the eyes, over the nose and on top of the upper lip! I left the scoby on for 1/2 hour, then removed it gently. WOW!! It made my skin look TERRIFIC!! I took the scoby/mask & dropped it into a little Mason jar with some KTV to keep it full of those gorgeous acids and enzymes. With careful handling, I should be able to reuse it several times!! Combine all ingredients in blender and blend until combined. Will keep in fridge for at least a week. Hi, I had to find your page again to comment, I use kombucha vinegar for everything that requires lemon juice or a little tartness. Ive been making delicious hommus with it lately and even put a dash in mashed potato. I accidentally made ktv,at first I was bummed. Then I remembered seeing store bought vinegar infused with various herbs.I bought sprigs of rosemary and used lots of garlic (we are garlaholics)and placed my gallon of vinegar in the fridge. I have been using this mixture for salad dressing and to make Xtra sour dough bread that has hints of rosemary and garlic. I put flour,some sugar and a pinch of pink hymilayn saland set in a warm place in the kitchen. I feed my mixture for a few days. When it gets really bubbles, I then make my artisan sour dough bread!I love it Xtra sour and the garlic makes it so yummy.I have used my mixer with the dough hook when the dough is sticky, but manageable I turn it out onto a floured surface and knead, let it rise and I form the dough in a round shape when iraises again I place it on a stone baking sheet bake ware and bake at 350.lately I’ve been adding some virgin olive oil to my dough mixture. I have been brewing KT vinegar for a couple of years now. It is my favorite household cleaner. The longer I let it ferment I have started to notice crystals forming on the cloth covering the top and around the edge of the container above the liquid. I was wondering if anyone else had noticed this happening. Possibly acetic acid crystals? These are definitely crystals of some kind, not mold, and only seems to happen when the vinegar ferments quite a long time and evaporates some. Anyone else seen this? My first thought is they could be sugar crystals if the KV isn’t sour enough. Crystals may also form in cooler temps so as it warms up, you may find the crystals disappear. Secondly, I see Hannah your wrote never to put the scobies in the fridge, but I was told this is the hotel for when you are not using them…now I am confused….can you clarify so I can take them out of the fridge or not….I just have so many and not enough containers for the tea. Finally, I do have one large plastic water bottle that holds 5 litres which I used with my last brew, I know I should use glass but it held all that I needed it to hold…..I put it in the fridge and it was fine…..can u tell me if this is ok, and could the bottle have exploded from the pressure a)if I had left it out of fridge and/or b) in the fridge? 2) Take them out of the fridge. They may need to be composted and from the sound of it, you have more than you need, so it might be a perfect time to let some go. Here are some other uses for SCOBYs. 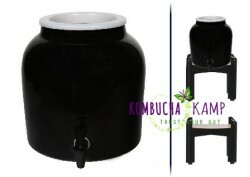 3) Some prefer to 2F in plastic because it is not prone to explosions whereas others are concerned that the acidic Kombucha will leach toxins from the plastic. Of course, bottling in glass always runs the risk of explosion (at room temperature). Pick your preference! Shrubs are becoming popular again. Has anyone made any shrubs with KV? Thank you so much! I wasn’t sure what to do with my forgotten Kombucha so thank you for answering my questions. Hi there. I have been trying to get my kombucha vinegar to taste as strong as apple cider vinegar. i find that i can hardly taste it on salads etc. should i add more sugar or something- if i specifically want vinegar rather than kombucha? 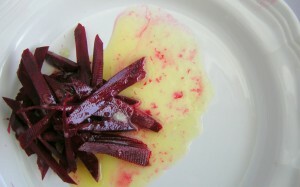 Adding sugar will help to increase the tartness – that and allowing it to ferment for longer. Thank you so much for your suggestions- I found this page after returning from a 2 month trip and coming home to big jar of kombucha vinegar. I started using it as conditioner, instead of apple cider vinegar. After infusing it with Kaffir lime (aka bergamot) my hair has never been so beautiful and soft, and my chronic dandruff is completely gone. Kaffir lime is traditionally used in Southeast Asia for healthy hair. The peel contains the natural oil with the beneficial properties, so I cut it off the fruit and let it soak in the kombucha vinegar for 1-2 weeks like you suggested. It makes for a delicious citrusey scent. I also put a little bit of kombucha vinegar in face masks- mixed with tumeric, yogurt, fresh aloe gel, honey and spirulina- and it leaves my skin hydrated, exfoliated and plumped up. I’m just careful about getting it in the eyes- the pro-biotic bacteria can cause irritation. I am always trying to get stickers off glass jars and bottles to reuse for craft storage and other household storage. I have used Goo Gone which works okay but is expensive and hard to find. I read online that vinegar is good for dissolving gooey stickers so I tried it. Presto! It works great! Today I was cleaning out my Kombucha making jar and tasted the liquid that had been languishing there for a few months. Woo Hoo! VINEGAR! WOW! I decided to try it to remove the stickers from a pretty liquor bottle. I had strained it through some coffee filters to get the boogies out, so I laid those on top of the sticker! WHOOPIE! It works even better! I still had to scrape a little but it really dissolved that goop left by the sticker. I will bottle the vinegar and label it for other household uses! I just bottled my third batch via the continuous brew method, and my system is working great so far. The Booch tastes great, and my SCOBY is pure white and healthy looking. After I brewed my first batch, I drew out 8 – 16oz bottles of Booch. I filled the bottles close to the top, then placed them in a large plastic storage box (in case there might be a leak or busted bottle), and covered the bottles with a black bath towel…then placed it in my kitchen pantry. I then brewed 4 cups of new tea (4 green & 2 Breakfast Black Tea and distilled H20), and let it brew for 10 minutes, then stirred in 1 cup of organic sugar while it was still hot. Next step was to pour the hot sugared tea back into the 1-gallon distilled water bottle, and shake it up. I then checked the temp with a stainless steel food thermometer, and each time it has checked at just below 80 degrees F.
I then poured the gallon of new tea into the crock to replace the gallon I had removed. So far this has worked perfect for me, and easy to do without too much fuss. During the bottling process I have been trying a few different flavors, and they have all tasted good, just very little Fizz so far. During the last batch I filled each bottle all the way to the top, then used the new caps I purchased from Hanna (instead of the old plastic GT ones). The nice thing about the new caps is that the inside of each cap drops down into the bottle a little, just enough to help displace any air that might have gotten trapped in the bottle and prevent the CO2 production we want. So at this point I have one batch in the fridge (that I am drinking), and two batches in the pantry covered and fermenting. Going to let the second batch ferment for 7 days this time, and the third batch maybe for 10 days? Hope that puts the Fizz into Booch that I am looking for. So for now I am a happy camper! Yay! Glad to hear you are enjoying your CB. As for the fizz, you may want to remove the bottles from the fridge for a few moments to let the yeast wake up. When it is too cold, they may not make any bubbles. I personally never put my booch in the fridge and drink it over ice when I want it cold. I let me first batch sit for a month before adding mango for the 2nd fermentation. I tried it 2 days later and it is super vinegary! Since I added mango can I still make vinegar out of it? I have it in the fridge right now so should I remove the mango and let it sit on the counter for awhile? Yes – use it for marinades and salad dressings. You may want to strain the fruit out if you will be storing it for a longer period as the fruit may cause the flavor to change over time (not in a good way). Having been bothered from heartburn and all kinds of digestive problems for so many years, I started drinking Kombucha ( bought at our coop). 10 days ago I placed about 4oz. of Kombucha combined with ” Yerba Mate tea” and the sugar, in a glass bowl, covered it with an old , clean cotton kitchen towel, and am keeping it in the bottom of my closet. On top of the liquid there is now a ” scoby” ( fairly thin) and the liquid tastes slowly less sweet, almost like the Kombucha I buy at the coop. Since the Kombucha culture reproduces, it is best to start with a quality culture for a lifetime of healthy brews. 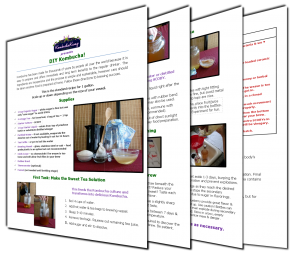 Here is an article about growing SCOBYs. Yes. If you will use it for cleaning, then that will be fine. I love cooking with Kombucha vinegar. I use it when making Chicken Adobo, which is a filipino dish and calls for apple cider vinegar. I like it on my tomato, cucumber and mozzerella salads too. I have three gallon jars going on rotation and i have a scoby hotel that was filling up too fast, so i separated a few scobys out into smaller jars just to make KT vinegar. I also use KT on my face. It’s a great skin softener. I’ll need to try it on my hair next. We have very hard water. Thank you for your webpage Hannah. I recently got my mom to switch from apple cider vinegar to kombucha vinegar. In the summer we have tons of cucumbers, onions and tomatoes. We would slice them and add vinegar (sometimes a bit of sugar) and let it sit overnight. This makes a wonderful salad. Now, when I brew my kombucha to drink, I have another batch going for the vinegar. My Grandma (cooked with vinegar a lot!) was from Germany, she said that using vinegar cleaned the “fatty rubbish” from our bodies. That still makes me smile. Thanks for sharing, Nettie! I love making tomato, feta salad with KV. This time I also added cucumber & a little onion – yum! Very pleased to read this article. I left my kombucha way too long and it had turned to vinegar. I have just descaled my kettle with it! Just covered the element and boiled it up and about 20 minutes later, the limescale was gone! Fab. I then mixed up a batch with some liquid soap and water and put in a spray bottle. It shined up my stainless sink nicely and removed limescale from around the taps! That’s a great idea about the spray for shining up your stainless steel sink Carol. I have very highly mineralized water here and I’m looking forward to giving this a try. Thank you! Just want to clarify, the K vinegar is fine to just store in the pantry, right? Does it have a shelf life or time frame you would recommend to use it up? Thanks! Shelf life is indefinite for KVinegar. However, if you are infusing with herbs, you may want to remove them after a couple of weeks to prevent off flavors. Im a Kombucha brewer & consumer & I am just now starting to read up on how to use my over-fermented batches & excited to try out some new kombucha projects. I read in the comments how 1 gal used the tea to dissolve chicken necks for a bone broth & Im concerned….if the vinegar so readily & rapidly dissolves chicken bones, what does it do over time to our teeth (with daily consumption)?? If it does indeed slowly strip the calcium from our teeth, then should I b concentrating on supplementing extra calcium or take a bone-building supplement mixture or just eating more calcium-rich, green, leafy veggies? Just wondering what is the smartest way to avoid enamel-wear if it’s a preventable threat cuz Im already aware of the immense benefits of regular Kombucha consumption. Thanks! Kombucha is alkalizing. 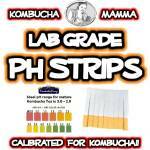 Although it is acid on the pH scale, when it hits the digestive system it does the opposite and helps the body remineralize. In terms of breaking down chicken bones, that process likely takes an extended period of time. Enamel damage is due to the mouth having pathogenic bacteria. When you drink KT, you put the healthy bacteria back into your body which balances the whole system. LOVE the info!! Thank you! What is the affect of Kombucha vinegar on hair color (herbal or regular)? Some have discovered that regular consumption of Kombucha can restore gray hair to its original color. It doesn’t affect every body the same way, so your personal results may vary. I make a KV/ lavendar oil facial toner. I’m going to switch to tea tree oil since the weather’s getting warmer.Something really cool-I gave a freind some of this mix a few weeks ago to try on her son’s medication-resistant eczema. It worked so well that his dermatologist is going to give me a call soon.She said she has other patients that are the same way and everything they try doesn’t work or stops working after a few weeks. I wonder how this is going to go? I also have a freind with this rash between her thighs that is medication-resistant also. YAY KOMBUCHA!!! Wow, would love to try this for my husband’s eczema. How much lavender oil/KV did you use, and did you dilute it at all? I can not tell you how relieved I am to FINALLY figure out what the problem was! I don’t recall reading this anywhere about needing to keep the SCOBY in a particular size range (I think this probably affects those of us who choose the CB method primarily) for proper fermentation and it is such a VALUABLE piece of the puzzle IMO! If I have missed where this is in print in your ebook, could you bring it to my attention? And if it’s not maybe you can add it next time you update the book and also post it somewhere on your site somewhere with the CB brew FAQs or under “things to be aware of”? Your awesome Hannah and I’m so grateful for you and this forum!!! I also have kombucha vinegar! Yeah! Question is my scoby is huge as my container is wide. Can I cut it into quarters with vinegar dipped scissors and run 4 batches? Theoretically, yes. However, make sure that you have enough culture & starter liquid for the smaller batches so they don’t get mold and have a full Kombucha flavor. Hmmm, maybe this is my problem? 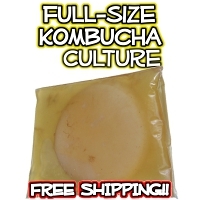 So a too thick scoby won’t ferment the kombucha properly? Would that lead to a vinegar situation? How often should one “thin out” the scoby? Mine does get thick quite rapidly. The short answer is yes. Kombucha needs oxygen to ferment properly. 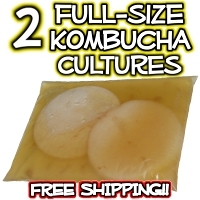 If the SCOBY is too thick, it only allows for an anaerobic process to occur which favors the yeast rather than the bacteria which can cause off flavors. Trim your SCOBY with a pair of scissors (dip in vinegar to sanitize). I really need help. I’ve been brewing kombucha for a year now, and have my first salty tasting batch. I checked everywhere for mold, but did or find any. Please advise!! Maybe you used salt instead of sugar? Toss it and start again! Am I reading the chicken brine recipe correctly that you put the butter on the skin BEFORE soaking in the KT brine? I’ve always buttered my chicken just before it goes in the oven. I’m looking forward to trying this with the chicken and herbs I got at the farmer’s market this week! I have several layers of scobies in each of my jars … at some point do i pull them apart and place them in a scoby hotel? I left my continuous brewer alone for a couple of month and now have a bunch of vinegar. I’m trying to convince my wife that we can use it so I went looking for this article to provide proof. I can use a cup or two of the vinegar to start my new batch right? Yes! Kombucha never “goes bad” or “spoils” due to its protective, low pH. Kombucha Vinegar makes excellent starter! Is there a time limit to how long you can infuse herbs/spices in kombucha vinegar? I was thinking of bottling the KV with some garlic or chillis or herbs like basil or maybe some orange peel and then giving it as gifts. Thanks for this really useful article. Garlic and herbs can be left in the bottle for extended periods of time. I’d be cautious with chillis as they can be quite powerful in the KV and may need to be removed after a few days depending on how spicy you want the vinegar to be. I have let my booch ferment too long and am sure it is vinegar now. Can I still use one of the ‘scobies’ to make a new batch or are they ruined? Also, is it OK to have more than one scoby in there? The sourness of Kombucha vinegar doesn’t adversely affect the cultures, so you may use them again to brew up a fresh batch of booch. You may keep a couple of cultures together but if it gets to be too thick of a layer, then the Kombucha won’t ferment properly as it won’t allow for oxygen exchange. 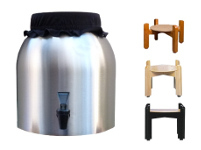 The fermentation process for Kombucha is both aerobic (with oxygen) and anaerobic (without oxygen) which is why we use a cloth cover rather than a lid. What do you mean to thick. do you mean too wide so that it turns it anaerobic? I am a newbie also. How much culture is in the Scooby anyway as compared to the liquid starter and so I’m sure a lot of beginners ask this but if I put two scobys etc will it produce the kombucha faster. I guess I’d like to know more about what a Scoby is anyway and why you really need it at all if you have an extra minute! Thickness does not refer to width. Yes, adding a 2nd SCOBY CAN speed it up, but there is a point at which there is too much culture in the vessel (ie too thick) and then it slows down because there isn’t enough oxygen penetrating the liquid. The scobie’s are fine and you can add a cup of your strong brew with your scobie to start your new brew. I normally end up removing some of the old scobies especially in warmer weather. It seems to make it to fast. I’ll often toss the oldest darkest ones and keep one or 2 lighter ones. It helps timing the brew I like to wait 12 days to 14 days. Each chapter arrives via email – 1 a day for 5 days. 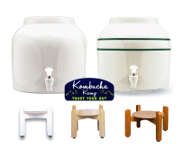 I went ahead and restarted your subscription – check your spam folder if you don’t see an email from Kombucha Kamp! Shoot! Wish I had found this sooner…I just poured my last batch down the drain because I let it go too long. At least I’ll know for next time. I have a continuous batch that has been going for months. This morning while adding the sweet tea mixture to the container, I accidentally picked up the white vinegar that I rinse my hands with and poured a small amount in before realizing! Have I ruined my perfectly tuned batch???? No adding a small amount of white vinegar is recommended when starting a batch it raises the acid level making it hard for mold to grow. when you get your kombucha going it is not necessary but wouldn’t hurt it. PS don’t use apple cider vinegar as it can add foreign batchiara and hurting the original Kombucha mushroom. Only use distilled vinegar in a pinch. Best to just use good, fermented KT as your starter liquid as it has the healthy bacteria & yeast. I’m soo glad my accidental Booch-Botch turned into yet another form of liquid gold! Just wondering if you have put KTV in another batch of chicken broth and had the same experience? This is really interesting. I would like to make bone broth for my dogs. I’ve been trying to find a way to cook the bones down until they dissolve, now I know, add vinegar. Thanks Faithful! May I ask how much vinegar you add to about what quantity of broth? Can share your broth recipe? Is it like making regular chicken stock? thank you so much! I make both chicken & beef broth. They are basically the same recipe: Chicken heads & feet or Carcass – Beef knuckles or tail – mire poix (celery, carrots, onion), scraps, 1-2 cups of Kombucha Vinegar and simmer for a few hours! I always put some of my finished brew into a large glass dropper bottle and squeeze onto cotton pads as a toner/makeup remover. Of course being careful around the eyes. I mix it with clays twice a week to do a facial mud mask. I also use it as a hair rinse and a cleaner in place of sprays. It really removes a lot of dirt! Brilliant! A friend and I were JUST talking about doing this! Thanks for the info.